An abandoned shop at Saddar Bazaar. In a modest shop in Sadar Bazaar, Bijbehara, octogenarian Mohammad Abdullah Bangi is busy selling traditional Unani medicine to customers. Operating from this space for more than last 60 years, his shop is a vital part of the centuries-old market located on the calm banks of river Jhelum. Once a hub of business and trade, this market is a key to the highway town’s history and culture. Supposed to be around 150 years old, the market is a replica of Srinagar’s historic Maharaja Bazar and Zaina Kadal markets. Compact and congested, the twin old city markets are also located on the same river that has helped life survive for various millennia. A strong herbal fragrance lingers in the air at Bangi’s shop. Few beakers lying in a corner, used for keeping locally made sharbat and syrups, give it a look of an alchemist’s abode. Countless green tin boxes with names of medicines written in neat Urdu calligraphic adorn the walls. Although visibly frail, Baangi remembers the names and usage of every herb and medicine present in the shop. What makes Bangi so content with what he is doing is that he has retained a tradition in a market that has set the traditions of trade and business. For centuries, the horsepower was much expensive in Kashmir in comparison to manpower. It took many more centuries for the Eka transport to pave way for motor transport. But what remained constant was Jhelum continued to exist as the highway of Kashmir between Khanabal and Khadanyar. Most of the post-medieval era markets were located on the banks of Jhelum. Spots, where the merchandise would be loaded or unloaded, were the Ghats. The Sadder Bazaar was also a Ghat of the Jhelum waterway. Dozens of boats would remain anchored there, ready to ferry passengers and goods to the Central and Northern parts of Kashmir. Since this was at starting upstream, very close to Khanabal, it was a key station for loading the grains and unloading of the merchandise that wholesales would ferry from Srinagar. Then, most of the supplies would come to Kashmir from Rawalpindi, now in Pakistan. Bangi’s faint childhood memories helps him to recall how it was like travelling to far off places in boats. Town’s senior citizens said the people used to hire singers and storytellers to accompany them on long boat journeys to Baramulla and Sopore. There was a fixed fare list issued by the boatmen community at that time. Back in those days, one could travel to Srinagar and Baramulla at three annas (18 Paisa) and six Annas (36 Paisa) of fare, respectively. An old man, seeking some herbal pain medicine, interrupted Bangi’s short tryst with nostalgia. Overhearing the conversation, the person chipped in with his own memories. The market was not only known for its finest silverware, grains and spices but also a centre of bookselling and literature. Elders recall how it hosted the only bookshop in whole Bijbehara town where students and scholars used to pay visits religiously to fulfil their literary needs. The shop, according to a local, was gutted in a fire incident in the mid-1990s. 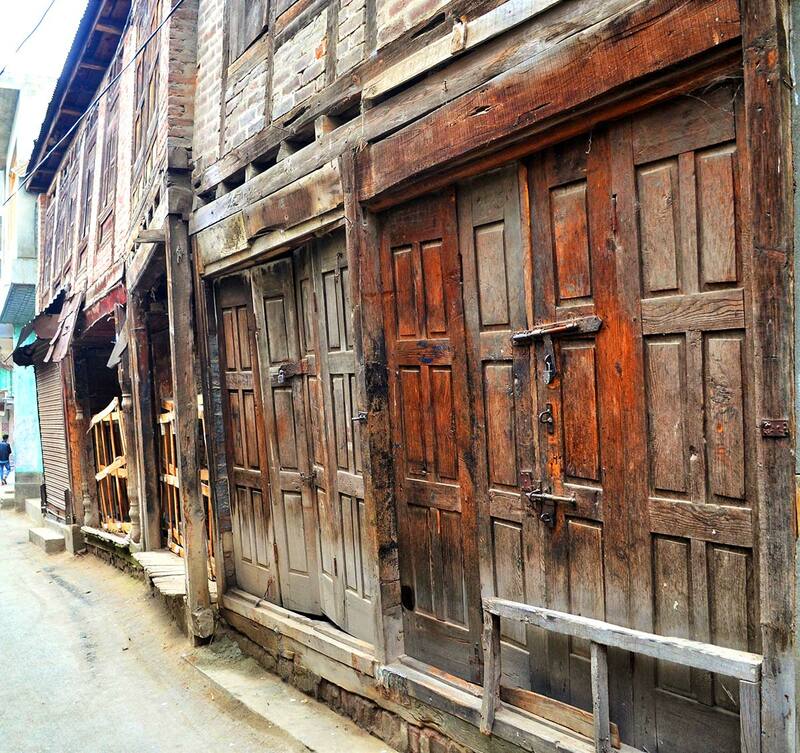 The medieval structures dotted with old wooden shops bear witnesses to its glorious past. Narrow and congested, it still defies the twenty-first-century market requirements. On festive days, it is impassable with a cycle. Old wooden shutters laden with big traditional locks are a common sight. 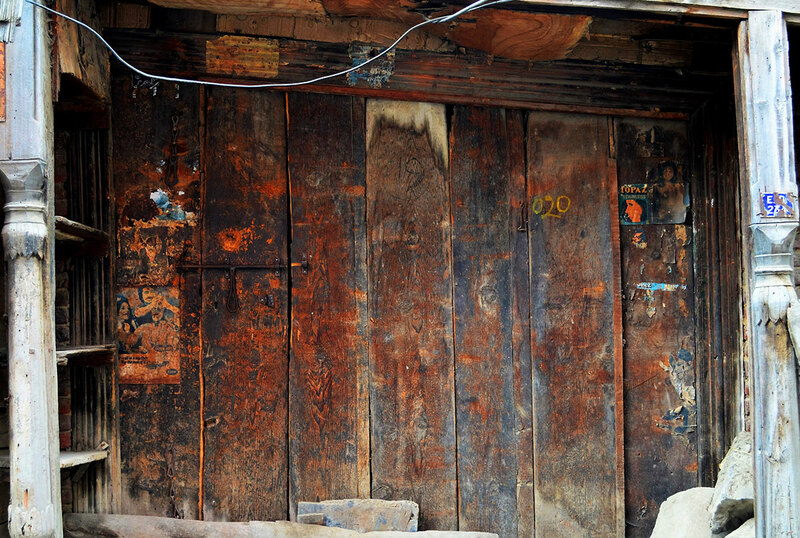 Few abandoned shops belonging to migrant Kashmiri Pandits covered in cobwebs and dust serve as a mute memorabilia of communal harmony and pain. Ali Mohammad Zargar, 73, is been running a shop in this market for the last four generations. He has turned pessimistic because he fails to foresee a good future for the oldest market. His grandfather had entered this market as a goldsmith, more than a century ago. As Zargar’s father took over, the family shifted to hardware business instead. While growing up, Zargar witnessed the market changing at an alarming rate, both on structural and commercial lines. Flash floods and few fire incidents changed the whole setup of the market. This old architectural marvel took a major hit in 1995when a huge conflagration left almost a dozen shops completely gutted. Although, Bijbehara is considered as one of the oldest and historic towns of the valley, its history hasn’t been documented properly. Whatever little has been written about the place, it solely relies on oral references. Dr Reyaz Ahmad Ganai, a young local history scholar is working to fill the void. An abandoned line of shops at Saddar Bazaar. As road transportation became common, the whole attention and trade activities shifted to Goerwan market situated on the Srinagar-Jammu highway, the main Kashmir passage after 1947. The shopkeepers started transporting goods by road thereby pushing water transportation and Sadar Bazar towards oblivion. Ruing no customer rush, many shopkeepers who have spent more than half a century in Sadar Bazar are packing their shops now. Even the traders, who are shifting from one market to another within the town, face a new problem. The new highway that almost replaces the old one, has bypassed Bijbehara. The business is reporting less work and nose-diving margins as footfalls fell. It is not Saddar Bazar alone. Almost all the markets across Kashmir that were linked to the Jhelum waterway are seemingly completing a full circle. It is as true with Maharaj Bazaar as it is with ZainaKadal. The twin markets in Srinagar have given up as the city expanded on the other bank of the river. Now Hari Singh High Street or even Batamaloo is making more business than both the markets put together. These markets might have less business but they all have huge heritage value. Only good planning will help them switch over to better business on a sustainable basis.